Yellow flowers on a stick. Prickly burrs that stick to clothes. Astringent. Leaf tea or cold infusion is used for jaundice and other liver ailments, colds, diarrhea, mouthwash, skin issues, ulcers, diuretic. Externally, a poultice or soak is used to treat athlete's foot, sores, slowhealing wounds, stop bleeding, and insect bites. Gargle with cold infusion or tea to relieve sore throats, inflamed gums, and laryngitis. Common herbaceous species include Agrimonia parviflora, Calystegia sepium, Dipsacus fullonum ssp. 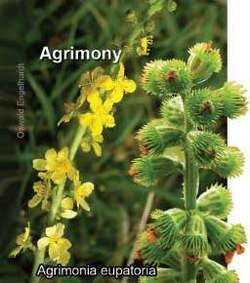 Agrimonia parviflora Aiton; Southern or Swamp Agrimony; Moist fields and meadows and moist open woods; Abundant, especially on the east side; (#); C = 4; BSUH 12653. Frequent to abundant spring to summer herbaceous species in Wesley Wet Area include Agrimonia parviflora, Antennaria plantaginifolia, Barbarea vulgaris, Chrysanthemum leucanthemum, Daucus carota, Fragaria virginiana, Geum laciniata, Prunella vulgaris, Trifolium hybridum, and T.